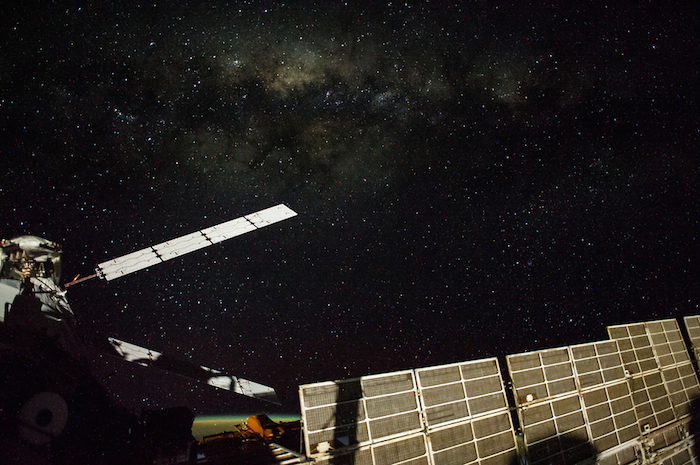 ISS041-E-009477 (13 Sept. 2014) --- One of the Expedition 41 crew members aboard the Earth-orbiting International Space Station on Sept. 13, 2014 captured this image of a starry sky. The white panel at left belonging to the ATV-5 spacecraft, which is docked with the orbital outpost, obstructs the view of Scorpius. The red star Antares is directly to the left of the bottom of the second ATV panel from the top. The two stars that are close together and on the lower left of the photo comprise Shaula, the tip of the scorpion’s tail. The open cluster close to Shaula is M7. The hardware at bottom right is part of one of the station's solar panels.